To give you some general ideas, a standard 8″x8″ (22x22cm) heatbed will use something like 200 watts. This corresponds to nearly 16/17 amps . 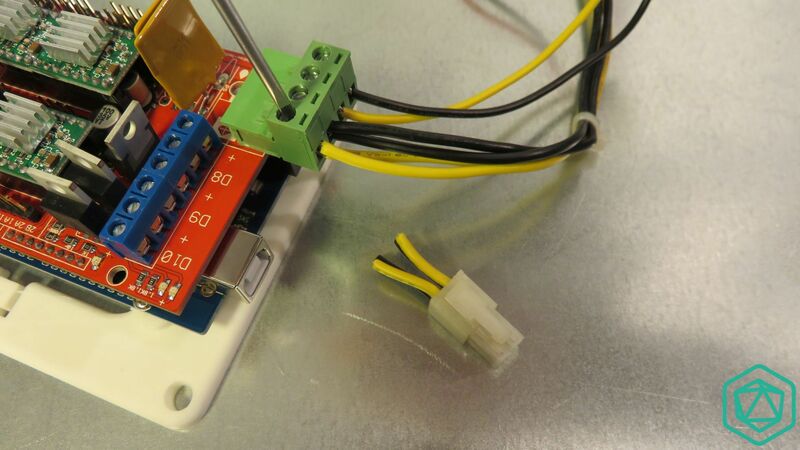 Regarding the hot end you will need nearly 40w, and the electronics including the stepper motor will use nearly the same power. So you need to have at least 90 watts ( about 8 amps) more only for this part. 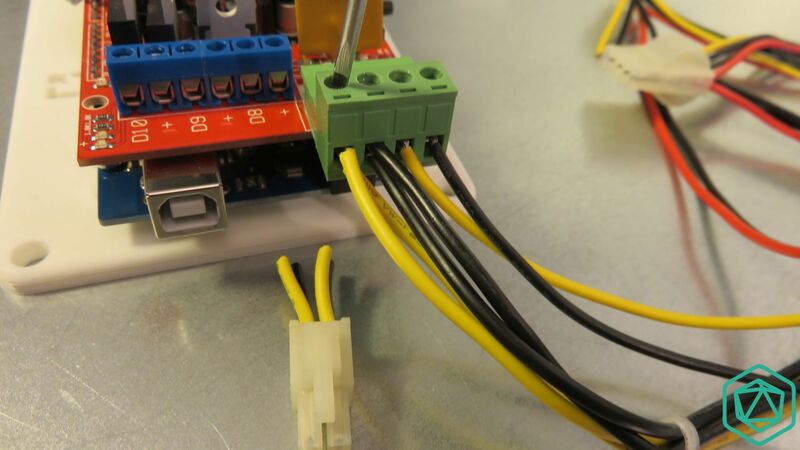 The 3D printer electronics is often made so that it has 2 or more separate power inputs. One is dedicated to the heatbed and the other one is dedicated for what is left of the electronics. So before using a ATX Power supply, it’s fundamental to check the 12V outputs.Here is a chart with the +12V1 and +12V2 that have at least 15 Amps each. 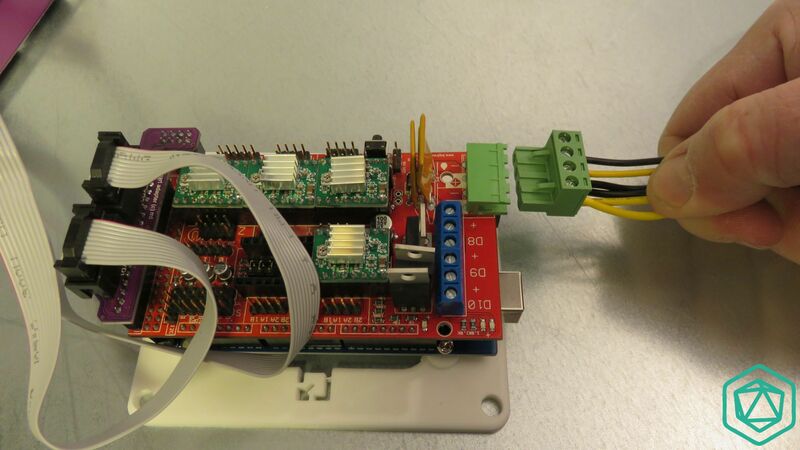 In our case we will use the 17Amps output to power the heatbed and the 15 amps one to power the other connector. 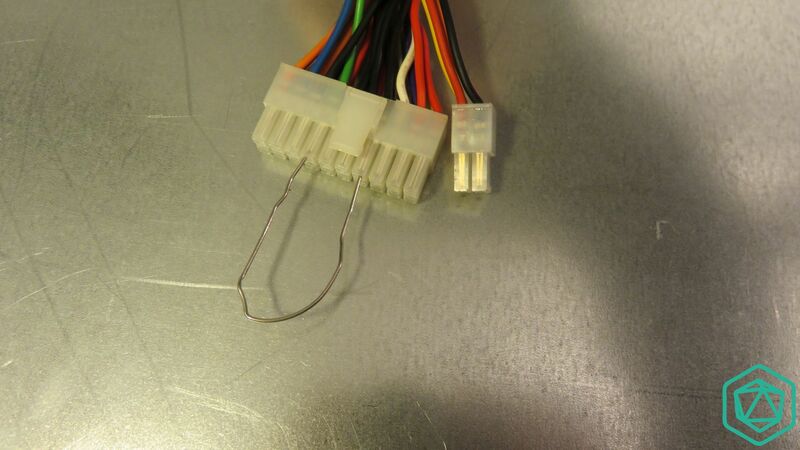 Most often the +12V1 and +12V2 are linked to 2 different kind of connectors. 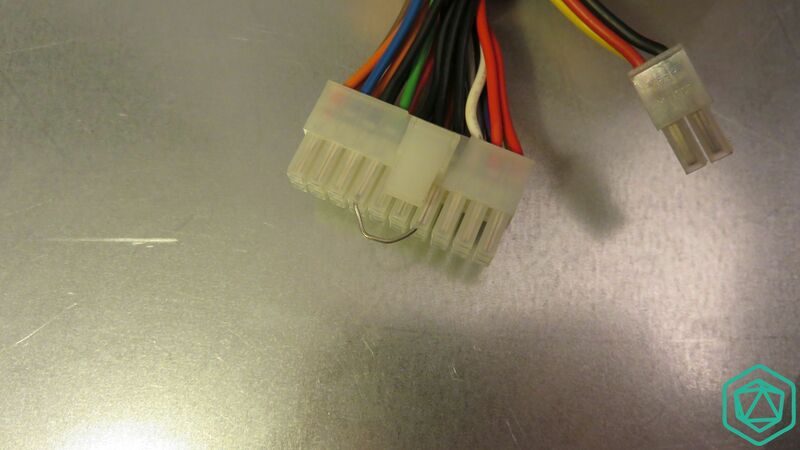 The +12V1 is often linked to the 4 pin molex connectors that you can see at the bottom of the picture. 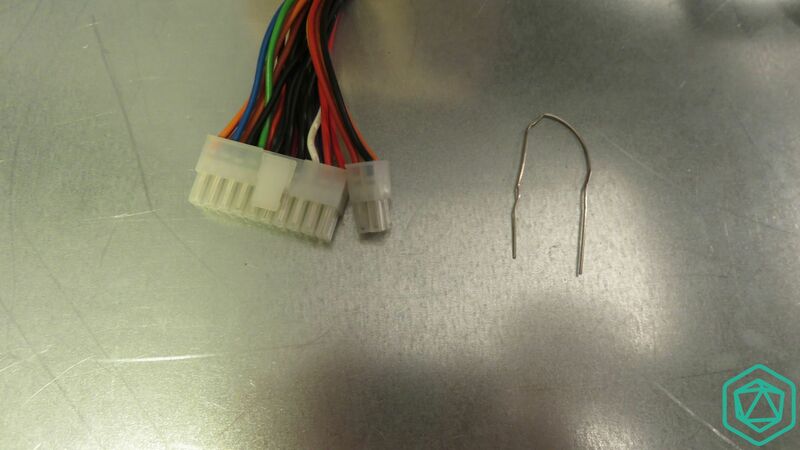 The +12V2 is often linked to the square 4 pin connector at the top of the picture. It’s him that power your computer CPU/motherboard. 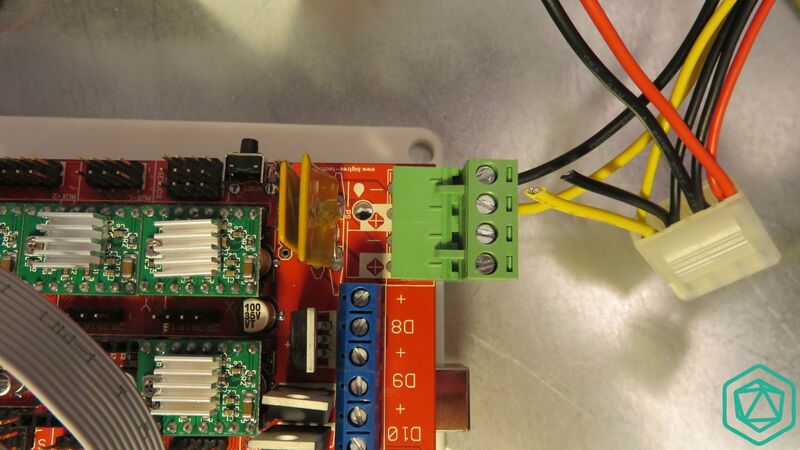 If you have any doubt you should be able to get more details on the datasheet of your power supply. 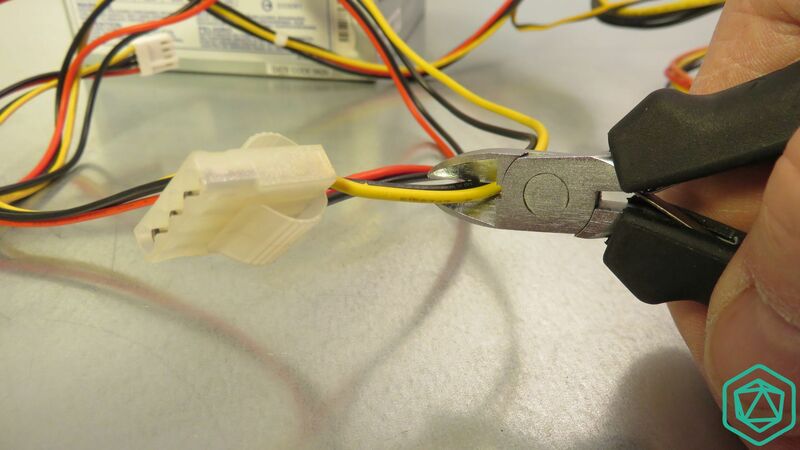 Remove the square 4 pin connector with cutting pliers or with a strong pair of scissors. Once cut you will have access to 4 wires: 2 yellow and 2 black. 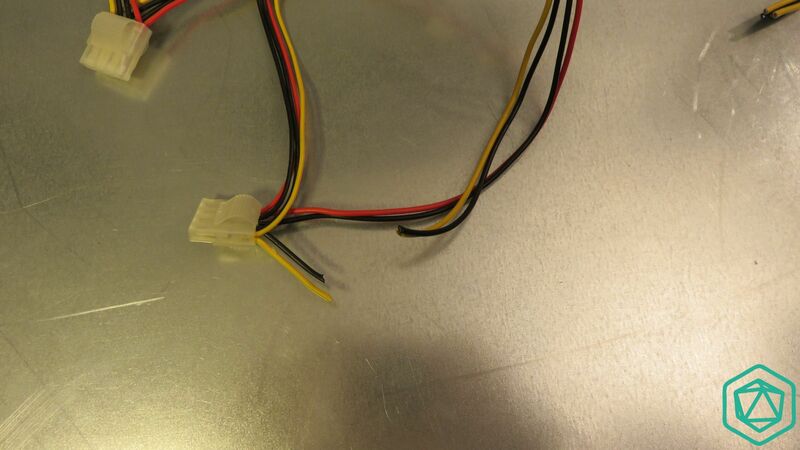 Now take a 4 pin molex connector and cut it’s yellow and black wires from it. You can keep the other wires on the connector . The red wire corresponds to a +5V and the black one to the ground wire (0V). If you decide to cut the whole set of wire be very careful to insulate them with some electrical tape. Once cut you should have something like in the picture. Note that keeping the connector and the other wires attached prevent you from insulating the left over wires. 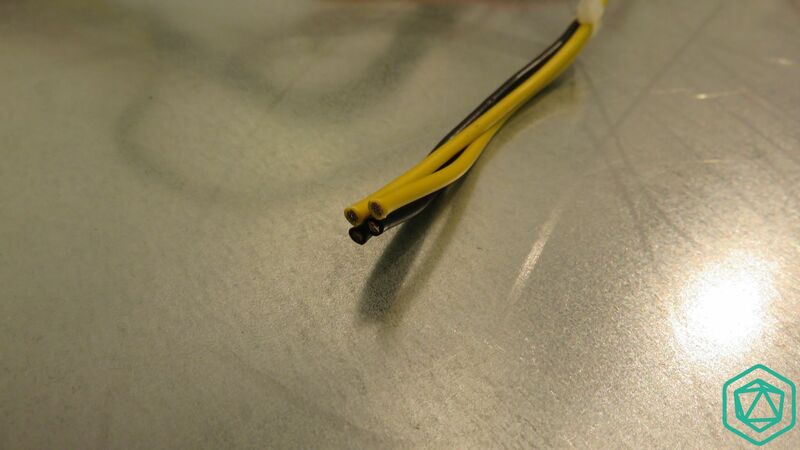 With your cutting tool, strip the black and yellow wires that you have just cut. 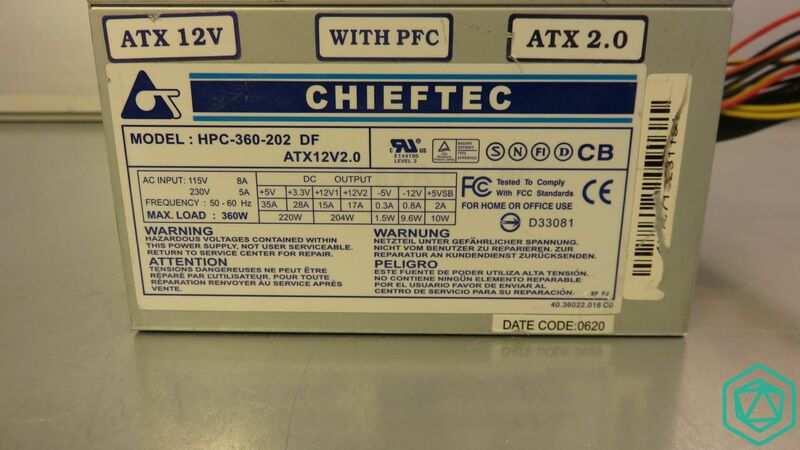 Now let’s look at the part that makes the ATX power supply start. By default, when your PSU is connected to your computer and you press the « power » button, then the power is provided to the motherboard and other devices. This is made on the very big plastic connector. Take a trombone or a short wire a few centimeters. Open the trombone entirely so that you can give it a U shape like on the picture. The power supply is waiting for the Green wire to be connected to the ground (any black wire) in order to provide the full power to your devices. On this connector you can have only 1 green wire. Right next to it on the same row you will have 3 or 4 black wires linked to the ground. Insert the trombone inside the connector in order to create a contact between the green and any black wire like in the picture. If the trombone seems too big you can cut it shorter so it’s cleaner. Here is an example of the trombone once cut. On your electronic side, now take the green mobile connector from the Ramps board. From top view you will get some marking telling you about the proper polarity of this connector with « + » and « -« signs. 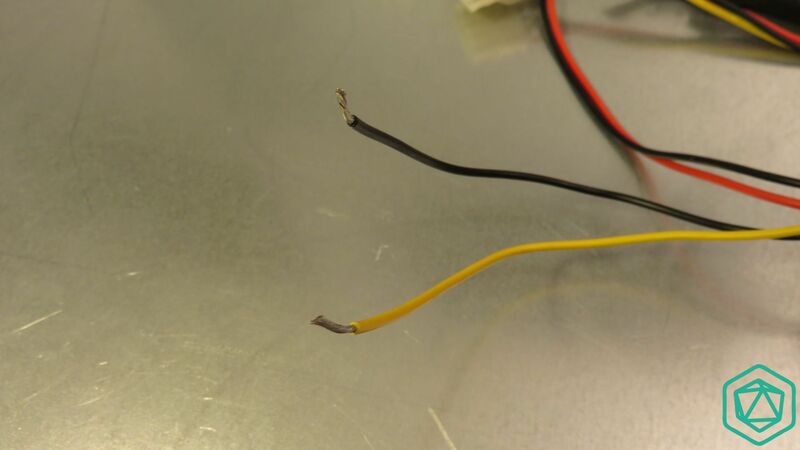 The « + » corresponds to the +12V so to the yellow wire and the « – » to the ground (0V) and black wire. The +12V will be connected just below. Those 2 wires are powering directly the stepper motors as well as the electronics of your 3D printer. Regarding the remaining wires, connect them on the 2 remaining green terminals. Keep the same polarity as before, the black wire then the yellow wire on the left side of it. Connect them 2 by 2 so the yellow together and the black wires together. 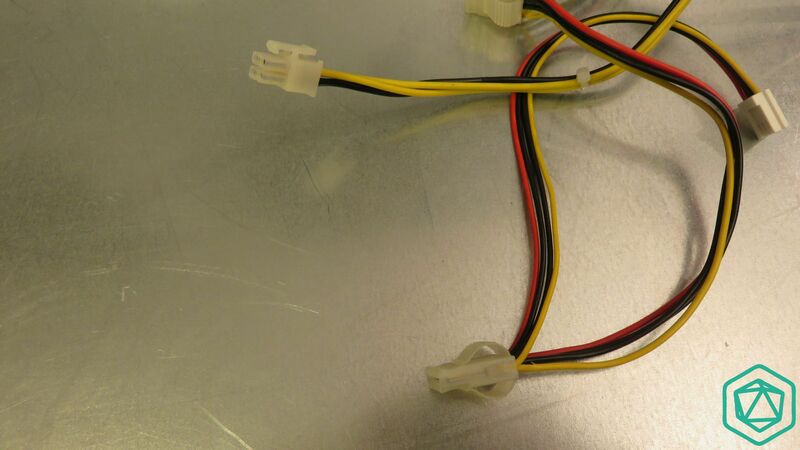 This last 2 terminals correspond to the heat bed power supply that will use most of the power. 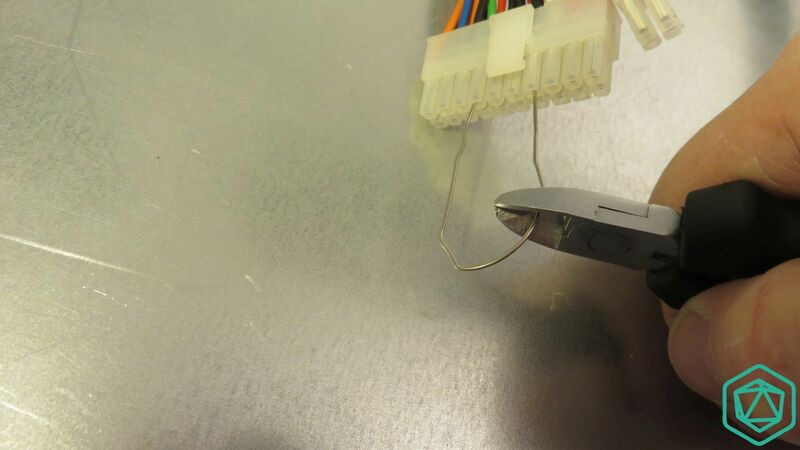 This mobile connector, once plugged will allow you to easily manipulate your electronics, fix it and then care for the power cables later on.. 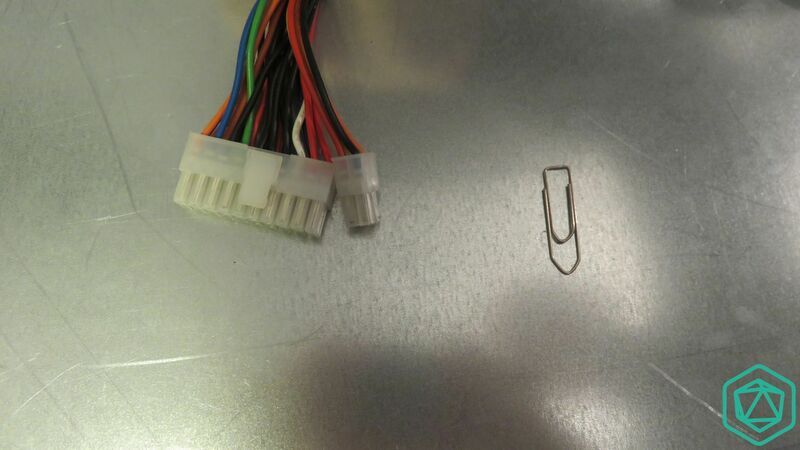 WARNING: Check carefully that this connector is well plugged and that the opposite male pins are properly making contact with this connector. 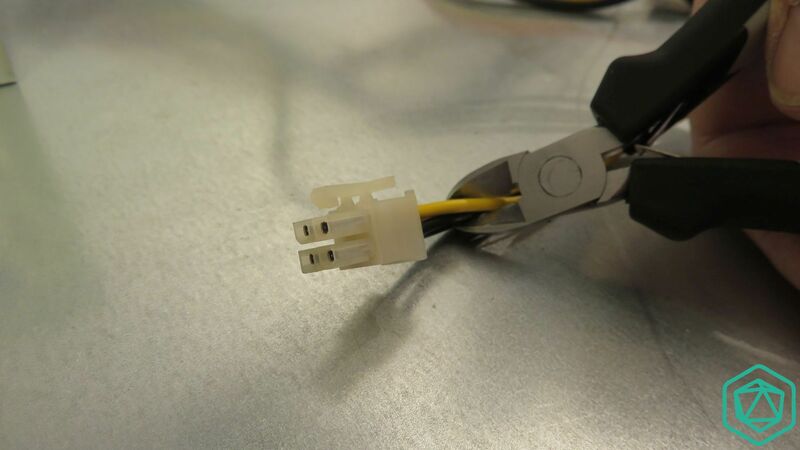 In a few cases, if a bad connection is made, after a few hours of use, this connector may melt/burn causing the power connection to break and causing some failures on your heat bed not heating anymore or your electronics not starting anymore. Check regularly that this connector is well plugged. Cette entrée a été publiée dans Alimentation, Imprimantes, et marquée avec 3D printer, ATX, convertion, psu, le 15 May 2015 par 3D Modular Systems.